Those of you who attended our AGM last year will remember Dr Richard Dixon telling us the story of the Edinburgh Community Solar Co-operative. We’re proud to announce that we’ll be running a day trip study tour up there on Thursday June 22nd to find out more. In collaboration with Edinburgh Council, ECSC successfully raised almost £1.5m and in 2016 installed panels on public buildings across the city. As a result, 16 schools, 3 leisure centres, 2 community centres and a day centre for people with a learning or physical disability are benefiting from cheap, clean electricity generated on-site. The schools also benefit through new learning resources and the wider Edinburgh community benefits through a community fund. It’s very much the sort of project we’re working toward putting together in York. Our trip will include an opportunity to meet Edinburgh councillor/s and co-op members who championed this joint project. We will also visit two or three of the solar sites.If you’d like to come, please book your place by following this link. Spaces are very limited – there are a few subsidised train tickets available for just £20 (rail tickets cost us £48), on a first-come-first-served basis, otherwise we will expect you to arrange your own transport. We’re taking the 8:55am train up and the 18:30 train back. If you are unable to join us on the tour but would like to know more, we will be organising a report back seminar and video conference with the Edinburgh co-op later in the year. It won’t be quite as good as actually being there, of course! 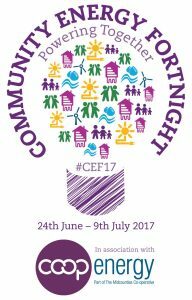 This event is slightly ahead of Community Energy Fortnight 2017, which runs from June 24th to July 9th. Find more events in our region and beyond on the CEF website – including a conference in York on Local Electricity Supply on June 30th and events in Whitby and Hull. Our next meeting, taking place at 7:30pm on July 4th, will be an open meeting & social – come join us upstairs in the Eagle and Child pub on Petergate! We’ll bring you up to speed on developments on our City Solar Farm plan, and brainstorm some ideas for our AGM later this year.